Carla Jean Ferguson, 71, of Little Rock and formerly of Blytheville, passed away Wednesday, January 2, 2019 at St. Vincent’s Hospital under the care of Arkansas Hospice in Little Rock. Carla was born in Blytheville to Carl G. and Opal Bumbalough Blackard. She was a retired nurse and a member of Highland Valley United Methodist Church in Little Rock. She was very involved with her church and always volunteered. Carla spent most of her time at church, with her church friends or with her granddaughter, Lillian. Carla always kept a clean house and enjoyed ironing. She was preceded in death by her parents; and step mother, June Gosnell Blackard. 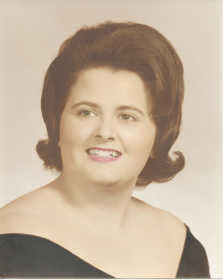 Carla leaves her daughter, Leigh Ann Wilson of Little Rock; sister, Padee Black of Grass Valley, California; step-brother, Ward O’Keefe of Murfreesboro, Tennessee; granddaughter, Lillian Wilson; special cousin, Linda Gale Cowden of Little Rock; and special friends, the Toombs and Dolven families of Little Rock. Funeral services will be held Monday, January 7th at 2:00 p.m. in the Cobb Funeral Home Chapel. Burial will follow in Elmwood Cemetery. The family will receive friends from 1:00 p.m. until service time at Cobb Funeral Home. A memorial service will be held Sunday, January 13th at 2:30 p.m. at Highland Valley United Methodist Church in Little Rock. Condolences may be expressed to the family at www.cobbfuneralhome.com.